When you have to cook every day for your family, well, you have to reconcile everybody’s tastes, which most of the time do not exactly coincide with yours!! An example? Stay away from fresh veggies and light food, and opt instead for rich and fat food…. (The only way to make my daughters eat vegetables is to cook them my special “vegetable soup” and my “orange creamy butternut squash soup“). Fortunately, sometimes it happens that I’m home alone, and I’m in the mood to cook anyway… and I get to cook MY favorite! olive oil, course salt, a pinch of sea salt, a pinch of pepper, a pinch of nutmeg and a pinch of cinnamon. Put a small pot of water on the stove (take a look to my post “how every Italian cooks pasta“). In another pot (on medium heat) pour a little bit of olive oil and add the onion, thinly cut, to brown it. While the onion cooks, cut the carrot in small, thin pieces. When the onion starts to become golden, add the carrots, and let them cook together while you’re cutting the zucchini. Once cut, add to the mixture the zucchini and the frozen peas. Then add the sea salt, pepper, nutmeg, and cinnamon. Stir the mixture, then cover the pot and let the mixture cook for about 10 minutes. 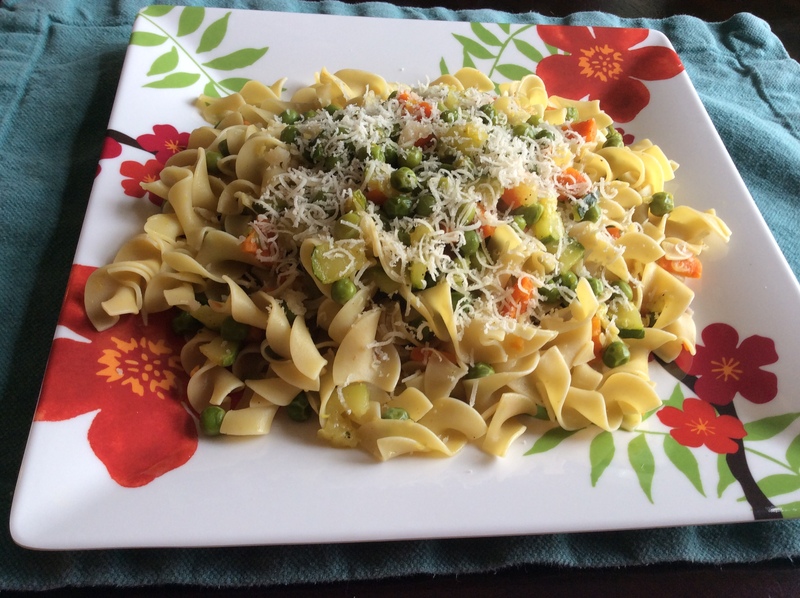 When the pasta is ready, mix it with the vegetables, spread with parmesan and… taste it! Tip: This mix of veggies would be delicious also if served as a side dish or as base for a vegetable risotto. I really hope you liked this recipe! To keep posting I really need the encouragement and support of my readers so, please, share this recipe on social media to friends and family and help support my blog! Much thanks!